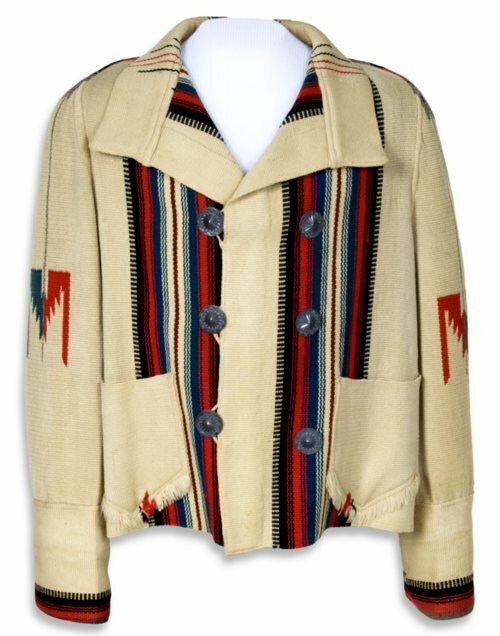 Man's double-breasted jacket produced by Hispanic weavers in Chimayo, a New Mexican village north of Santa Fe. Wool jacket with six silver-plated disk buttons down the front. It was a gift to Reb Russell from silent film star Tom Mix. The two appeared together in the film "The All American" in 1932. Russell was a native of Coffeyville, Kansas. He was a football player and, after his gridiron career, a star of Hollywood "B" Westerns.